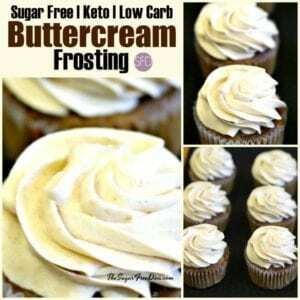 Since this Sugar Free Buttercream Frosting recipe was first published it had become very popular. I like that it is even possible to make to be honest with you. However, this is not a hard frosting to make. This could be the most popular kind of frosting out there. That is because there it is not only tasty, it is also easy to match with flavors of cake and cupcakes. Thus, there are a lot of uses for this frosting. This is a great frosting for just about any flavor of cake. I like that I can use this frosting with a chocolate or white cake. 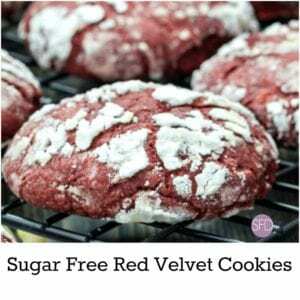 It also tastes great with red velvet (think Valentine’s Day!). However, this frosting would probably work with just about any cake. 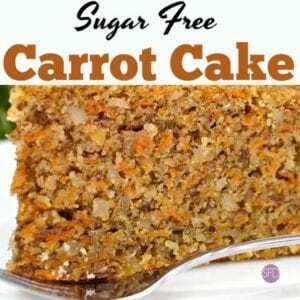 Making this recipe sugar free makes it even better. You will need to use sugar free powdered sugar in this recipe. 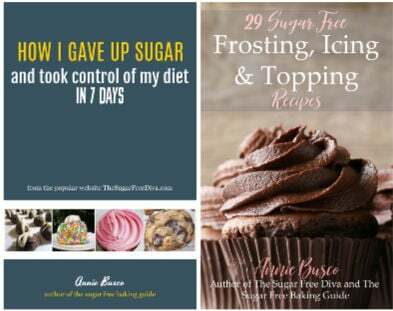 The good thing is that you can make this sugar yourself using this recipe or buy sugar free powdered sugar online here. Here are some cake recipes that you can make to use with your frosting. Also, Sugar Free Red Velvet Cupcakes. And Sugar Free Yellow Cake. Much as I like to make my own sugar free powdered sugar, you could buy your own as well. Milk, Cream, Whipping Cream, or similar dairy- 1 tablespoon (can use up to 2 tablspoons if you want a more fluid frosting to work with). I recommend using standing mixer if you have one. Also, fit the mixer with a whisk attachment. Cream together the sugar free powdered sugar and the butter by mixing on low for one minute. Once these appear to be somewhat blended you can increase the speed to medium to get a more whipped texture. It should take about 2 1/2- 3 minutes to get a good texture. Scrape the sides of the bowl by hand and then add the milk (or alternative)and the vanilla. Start with 1 tablespoon of the milk and add more as needed. Finally, continue to mix on medium for 1- 1 1/2 minutes or until you get that desired consistency. This frosting works great in a decorating tool or with tips! This is how to make sugar free butter cream frosting. Butter- 2 sticks 1 cup softened to room temperature. Milk Cream, Whipping Cream, or similar dairy- 1 tablespoon (can use up to 2 tablspoons if you want a more fluid frosting to work with). Scrape the sides of the bowl by hand and then add the milk (or alternative)and the vanilla. Start with 1 tablespoon of the milk and add more as needed. Continue to mix on medium for 1- 1 1/2 minutes or until you get that desired consistency. See post for ingredient details. My favorite icing is Buttercream. I can start making cakes again and will be using the Buttercream recipe. It’s nice to know there’s a sugar-free way to make buttercream frosting. The icing it’s the best part of any dessert for me!!! This really looks great for a lower calorie option. Thanks for a great idea. I recently made cookies for my nephew who has dietary limitations. I swapped out Splenda sugar replacement, which I often do. They were delicious! This looks amazing! I want to try it for my sons bday! This looks nice! Thanks for sharing! Who would have thought that we would have sugar free buttercream❓My mother would have eaten it right out of the mixing bowl. Can you sub the butter with shortening? I have and it makes lighter, smoother frosting. 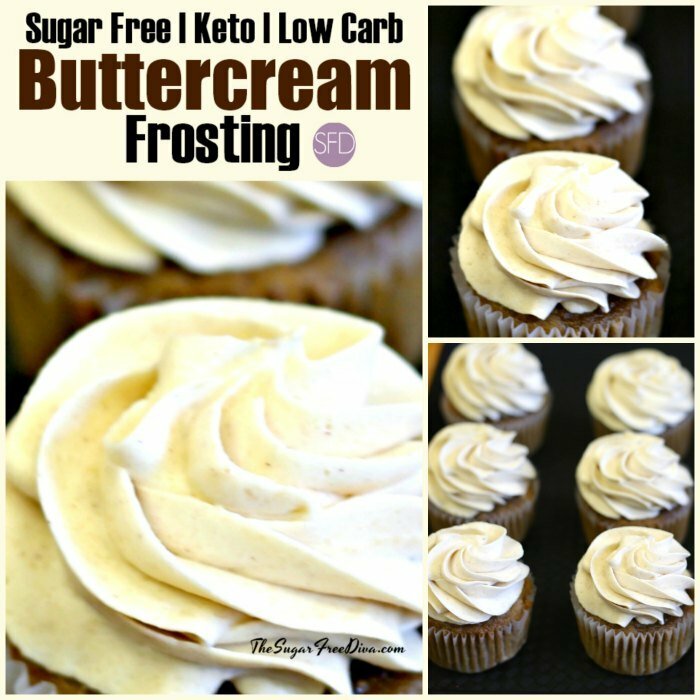 I’m newly diagnosed diabetic and just ran onto your recipe for sugar free buttercream. I’m wondering…am I supposed to make powdered sugar out of the sugar substitute and cornstarch first, using the blender— Or just dump it all in with the butter and mix? Also, have you ever added cocoa powder to this recipe? Thinking of using some cold coffee in place of the vanilla if I can add cocoa. I am not an expert on diabetic eating. I would make the sugar free powdered sugar first. I actually make extra so that I have some available for my next project. I am thinking about making a cocoa version of this/. That cold coffee may be a good one to try too. Thanks!! What is AP flour? In your cake recipes you call for AP flour. Don’t know what this is. So glad to find your recipes. I am on low carb diet. 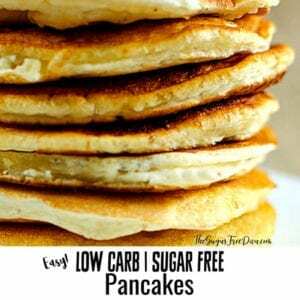 Do you ever use any of the low carb flours.in any of your recipes? If so what kind? I am a huge proponent of using Carbalose as a flour alternative. The folks who make Carbalose say that it has 80% less carbs than regular flour. Carbalose is made mostly from wheat, however it lacks most non-fiber carbohydrates. Alternatives to corn starch include arrowroot, tapioca and potato starch because they are similar in the their composition and how they act. Cornflour or cornmeal probably will not work well in this recipe. thanks! I believe cornflour is the same as cornstarch. If it’s white and powdery it is the same. Cornmeal is yellowish and grainy so that won’t work. Hi- Cornstarch and cornmeal are indeed two different items. This recipe did not work out well at all. I’m sorry to say it was lumpy, and sticks to teeth. I am wondering if you used the Yogurt or Whipping Cream. thanks for the feedback! I agree, I made it and it was very lumpy. Couldn’t get the lumps out and had to throw it away. Hi- Butter cream can do that. 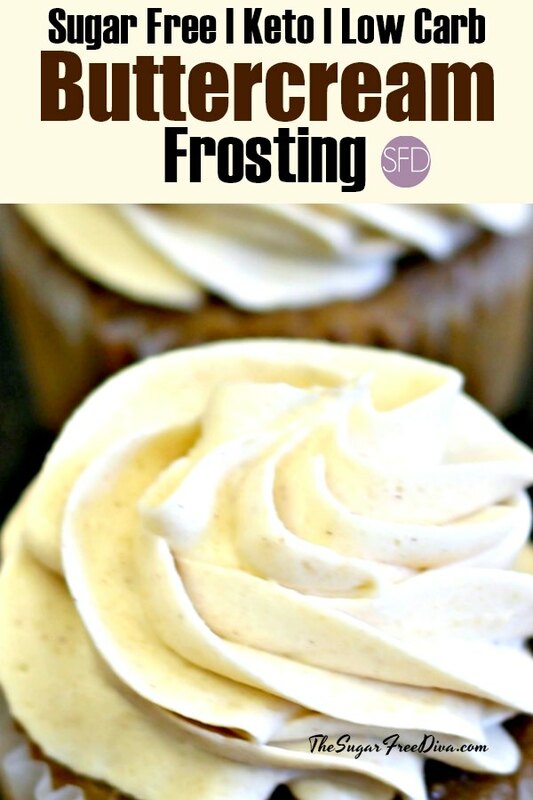 Try one of my othersugar free frosting recipes such as this easy one. Hi! Would this work as an icing for donuts? I’m looking for a white icing recipe that sets up to the touch and not runny or sticky. I’ve used the powdered erythritol and Splenda with butter and milk but it doesn’t set well. Can you help?? Hi. I would try a glaze. You can adjust the recipe on a glaze to make it more moist or harder depending on the amount of liquid that you add. thanks!! Could this be turned into a strawberry buttercream? My birthday is in a few days and I’m trying to help my husband make me the strawberry cake that I really want. They are so plentiful this year. I imagine we would need a little less wet ingredients. I’m wondering if some sugar free (dry- not prepared) strawberry jello subbed in would do it. What is the Nutrition Facts Per Serving and the Diabetic Exchanges? I was wondering when you are making the sugar free powdered sugar are you using the Splenda that is a sugar blend for baking? I was concerned because that Splenda you use 1/2 the amount of regular sugar so I didn’t know if I should use half of the sugar amount in your recipe. Hi. that is a good question. I would go by total volume.I use a granular (usually Splenda) that is 1:1 equivalent to sugar in volume. Hope this helps. thanks! !